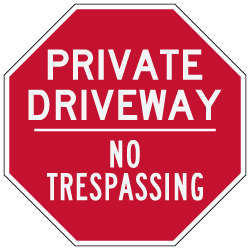 This Private Driveway No Trespassing sign available in 12x12, 18x18, 24x24, and 30x30 sizes. Our Private Driveway No Trespassing STOP Signs are made with Engineer Grade Reflective Sheeting and Rust-Free Heavy Gauge Aluminum with Anti-weather and Anti-graffiti protection Available. DOUBLE the working life of your Private Driveway Signs by adding 3M Protective Overlay Film (POF)! 3M’s high-tech POF protects sign faces against fading caused by the sun and harsh weather—and makes graffiti and sticker defacement damage easy to clear away without harsh abrasives. "Placing the order was easy, the price was right, the product was deliver quickly and in excelletn condition. Great shopping experience, much better than in store shopping.Thanks!" William W.